Urinalysis is the physical, chemical, and microscopic examination of urine. It involves a number of tests to detect and measure various compounds that pass through the urine. A urine sample is needed. Your health care provider will tell you what type of urine sample is needed. Two common methods of collecting urine are 24-hour urine collection and clean catch urine specimen. Is it clear or cloudy? Is it is pale, or dark yellow, or another color? 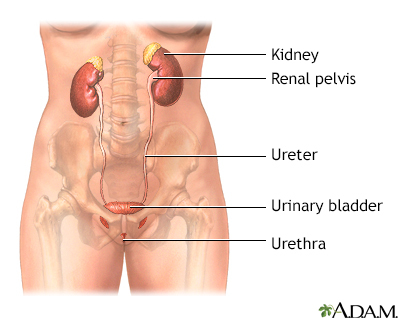 Check if there are any cells, urine crystals, urinary casts, mucus, and other substances. Identify any bacteria or other germs. A special strip (dipstick) is used to test for substances in the urine sample. The strip has pads of chemicals that change color when they come in contact with substances of interest. Certain medicines change the color of urine, but this is not a sign of disease. Your provider may tell you to stop taking any medicines that can affect test results. 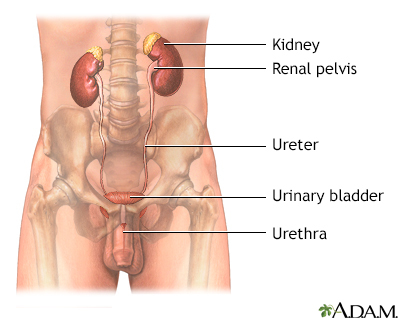 The test involves only normal urination, and there is no discomfort. Normal urine varies in color from almost colorless to dark yellow. Some foods, such as beets and blackberries, may turn urine red. Your provider can discuss the results with you. If a home test is used, the person reading the results must be able to tell the difference between colors, because the results are interpreted using a color chart. Chernecky CC, Berger BJ. Urinalysis (UA) - urine. In: Chernecky CC, Berger BJ, eds. Laboratory Tests and Diagnostic Procedures. 6th ed. St Louis, MO: Elsevier Saunders; 2013:1146-1148.